When playing basketball, a person’s skill set is only as productive as the equipment that allows them to perform at their maximum potential. It’s a given, but bad knees, ankles, wrists, elbows etc. will all let you down in any plight to becoming a decent player. However – there’s always a solution. Everyone knows that basketball is a sport extremely stressful on the legs. In particular – on the ankles. If you’ve got bad ankles, but still want to ball, finding the best ankle braces for basketball could be the answer to all your issues. Accordingly, in this guide, we break down the best basketball ankle braces in the market – looking into the importance of the brace and it’s impact on professional basketball players. As always, we look to PRICE and DURABILITY as contributing factors. However, as ankle braces are so important to player injury prevention, PERFORMANCE reigns supreme. What Ankle Brace does Steph Curry Wear? Want a brace that offers performance, but also backed by some of NBA’s top tier names? The Zamst A2-DX Ankle Brace could be exactly what you’re after. Beyond Steph Curry’s endorsement of its effects, the Zamst A2-DX Ankle Brace is well known in the athletic community. It is made with exterior dual mould and enhanced to perfection with lateral stability as well as medial. When talking design, the A2-DX showcases an open panel with fasteners able to adjust to any size of extremity to embrace optimal adaptability. Due to this anatomically correct design it can be properly secured to either leg, with the X-strap stabilizer giving support at 3 different pressure points. This means that you’re offered varying levels of compression – suitable to how you need it. Wearing any brace is a serious adjustment for anyone playing basketball. The Zamst in particular is an ankle brace that you will notice. Because it’s an extensive piece of gear, and not exactly just a slip on, you will notice the brace when you play. This will take some time getting used to, and something potential buyers should keep in mind. All in all, your ankle will be well braced with this option – and for us, it’s the best basketball ankle brace on this list. With a black or white color motif, the ASO Ankle Stabilizer is one of the most well reviewed options in foot support worldwide. Collegiate and pro players love it mainly due to its simple but effective makeup. The figure-eight style construction offers a methodical level of protection, and the nylon boot design is strong and predisposed to longevity. The effects of an elastic cuff are two prong in that it holds the laces still as well as distributes an additional measure of durability. Additionally, the ASO is not extra thick on the ball of the foot, which makes it more accessible to fitting inside a sneaker. The lace is also connected to the tongue; a nice addition keeping the brace centered regardless of how much motion the ankle is in. Further, the ASO is not a bare slip-on design, nor is it an overly cumbersome brace with too many features. Because it is somewhere in the middle, it is able to combine competence and lower tier pricing. Because the unit is bilateral it can fit snugly on either the left or right foot. However in saying that, the brace more adequately serves people with bigger feet, which are typically men. It can be a lucrative unit for women as well, but does not align perfectly for narrower feet. 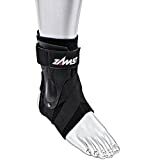 Well worth a mention in this list of best basketball ankle braces – and as an Amazon Best Seller, it’s hard to go wrong. With a jet black appearance, the Sleeve Stars Foot Brace is one of the most price conscious options available in this niche. If you don’t want to spend more than $20-$30, then this is your best bet. The tight and calculated compression promotes healthy, consistent blood flow, speeding up the recovery process for injured players. Effective in aiding the Achilles heel as well as Plantar Fasciitis, the brace employs a smooth, non-bulky structure that can easily slide into a sock as well as sneakers. However, being a sleeve, the Sleeve Stars can slide to the bottom of a foot if worn for a whole heap of time without adjustment. This can cause it to roll and be uncomfortable to stand on. Our recommendation is to make sure that the sleeve is in it’s upright and true position at every interval you get. If you’re worried about stability on the ankle, an extra strap is included to make any bothersome point on the ankle feel increased protection. The sleeve keeps feet dry by absorbing sweat, and the fabric is soft to the touch to slide on and off effortlessly. Machine washable as well to keep it clean and fresh. Being one size fits all and unisex, it is beneficial to both men and women. Definitely one of the better ankle braces for basketball. The Venom Ankle Brace is unique right out of the gate seen through the stabilizers that are positioned on each side of the brace. This is designed to promote posture while still accounting for required flexibility. Though a common choice for basketball, it can be used in a variety of sports including volleyball, cycling, and CrossFit, just to name a few. The construction of the arch is contoured to the grooves of a foot, and can keep pain from arthritis, fatigue or otherwise at bay. The laces are a double strap to make sure a firm fit is in place to decrease the odds of the gear shifting in motion. The Venom is also on the smaller end of braces and can slide into most shoes fluidly with little resistance. This is important because the less impact it has on walking the better served its user is to perform efficiently without noticing he or she is wearing it. Neoprene is moisture-wicking and extremely breathable, and its inclusion in the Venom is essential to keeping ankles dry and sweat away from areas that need further stability. It also offers sizes in small, medium and large; a noteworthy tidbit because one size fits all brands can fall off players repeatedly. 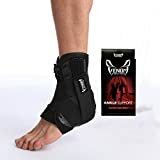 However, even though the Venom Ankle Brace is sturdy, if a lot of weight is placed on it the heel, it has been known to be susceptible to cracks. Further, even though the laces are competent in holding the sleeve still, they are a bit short, as opposed to straps that can wrap 360 degrees easily. Stable, great support and breathable – don’t leave this ankle brace out of your basketball considerations. 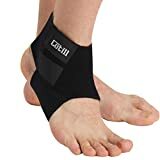 Providing the cheapest price tag of ankle braces on this list, the Cotill Ankle Support is not to be ignored just because it’s cheap. Sometimes all a minor sprain or tweak needs is a brace that offers comfort and compression; as opposed to pricey models that incorporate all the bells and whistles. Made with a neoprene material, it is extremely breathable and offers fantastic ventilation alongside its compression. This compression increases the flow of blood, which is the start of the process for long term healing. This black colored brace is ideal for people after surgery because it is not overly large or intrusive. The double straps are adjustable to create a more conformed fit, and in addition to basketball, can also be utilized with tennis, baseball, and even hiking. Further, the brace is unisex, able to positively service anyone. A one size fits all. Another great side note about this ankle brace is that it is one of the only ones that is better for a younger crowd. Teenagers can get just as many advantages in its use as older, more developed bodies can. However, because the Cotill is relatively small and more of a slide-on style than its competitors, it can be difficult to have the brace pinpoint tender areas of concern on the ankle. A one size fits all also means that bigger feet are not recommended. The fit can be so tight that circulation can be cut off. Even though it’s so cheap to buy, Cotill offer a money back guarantee to users who are not satisfied with its results. Unanimous MVP in 2016. A player who’s made his name at Golden State. Steph Curry is the face of the NBA. However, it hasn’t all been rosy. He’s had a significant history of torn ligaments. In 2011 Curry had surgery for lingering issues above the foot, and has become a staunch supporter of reinforcement. So… What does he wear? From what’s been revealed, Steph Curry’s ankle brace of choice is the Zamst A2-DX brace. He’s been a huge advocate of the brand, and has even posted a overwhelming positive review. As with all things that you purchase, it’s so important to know exactly what you’re after in a product. Buying an ankle brace for basketball is no different. Ask yourself the question, do you need stability? Do you only have a minor injury that only needs compression? Do you need an ankle brace to prevent further injury? There are ankle braces that are created to specifically target the different needs. Once you decide what you’re after, it will make finding the best ankle braces for basketball a lot easier. Fit is probably the second most important factor you need to consider when purchasing a basketball ankle brace. Buying something that’s too small will cut off circulation to your feet and will no doubt cause more problems than it’s worth. If the brace is too loose, it won’t deliver any stability and protection that you’ll expect. As you’ll notice from the above list, not all braces have a size guide. If a size guide is provided, follow it. However, some options only provide a one size fits all. Take note of this – especially if you have larger feet. One size fits all will more than often be too small for bigger feet. It’s always good to check the information that the product provides, alongside Amazon reviews for further information. 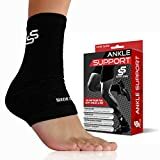 Looking for the best basketball ankle brace really relies on how often a player participates in the sport and how much stability they are looking to get out of it. For serious basketball players, it’s hard to pass up the Steph Curry recommended Zamst A2-DX. It offers maximum stability and comprehensive protection. However, if you’re a casual player, then something as simple as the ASO Stabilizer might be best for you. In our opinion though, the best ankle brace for basketball is by far and away the Zamst A2-DX – and will work perfectly with serious ankle injuries. If you have had an ankle injury and want to shed some light on the topic, or just have a different opinion on the matter, please don’t hesitate to get in contact with us. We’d love to hear from you.